This cute little teasel hedgehog has adorned our Christmas tree for many years. Short of taking him apart, I’m afraid that I can’t give you exact measurements for the fabric needed, but you can easily cut a circle from a plastic bag and do a test fit. Once you have the right size plastic circle, use it as a pattern for the hedgehog’s fabric body. Teasels grow wild in fields and along roadsides in Canada and the United States, sometimes forming dense patches of prickly stems and leaves, topped with the familiar teasel seed heads. You can gather the teasel heads in the fall, when they have dried naturally on the stem. Protect your hands with garden gloves and use a sharp pair of garden shears to snip off the teasel heads for flower arrangements or crafts. For this project, you’ll need one dried teasel head, with about a 1/4 inch of stem left on it, for each Christmas hedgehog. The stem end will be the hedgehog’s face. Wrap quilt batting or cotton wool all around the teasel, shaping the padding at the back to make a ball shape but leaving the stem end uncovered. Cut a circle from a plastic bag to make a pattern, allowing enough so you’ll be able to enclose the padding and gather it at the edge. Trace your plastic pattern on Christmas fabric and cut it out. Hand sew a gathering stitch around the edge of the fabric circle, approximately 1/2 inch from the edge, folding the raw fabric edge inwards. Place the padded teasel into the center of the fabric, and pull on the two thread ends to gather it. Tie off the thread ends to secure. Cut a piece of lace edging to fit around the top of the fabric, as shown in the photo. Glue the lace in place. Position and glue to black beads as the the hedgehog’s eyes. Glue one black bead to the end of the small stem to make a nose. Finally, glue some small pieces of artificial holly, red berries or mistletoe at one or two spots around the lace. 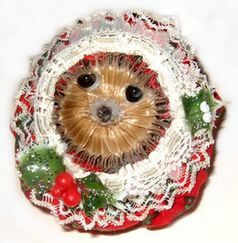 If desired, sew a loop of thread to the top of the ornament as a hanger.